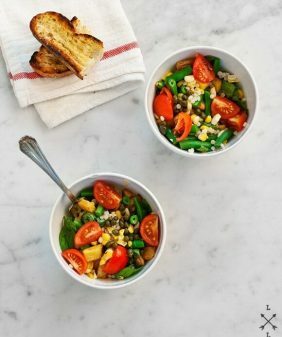 Crispy bread cubes tossed with tomatoes, basil, and ricotta make an easy, healthy, and elegant summer dinner or side. Add a poached egg for extra protein! The first time I put burnt toast on a plate for Jack, he looked at me and said “what’s this, am I your dad now?” I had just always assumed that burnt food equalled man food. So over time, I selflessly became the eater of the black toast… not quite as black as my dad would eat, but I’ve come to love bread with a nice deep char. 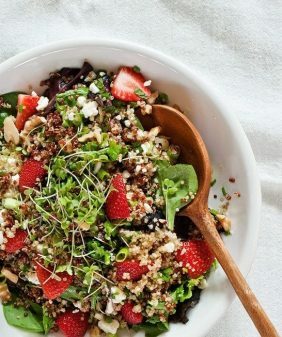 Especially in a salad like this. 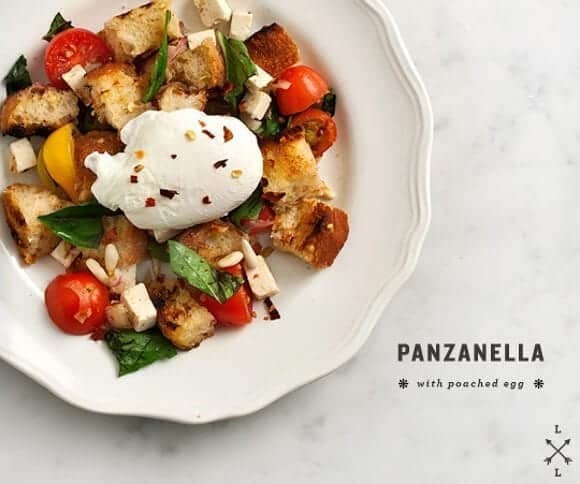 Toasty, garlicky bread cubes kick up your average panzanella… that char offers such a delightful contrast to the juicy tomatoes, sweet basil, and fruity olive oil. Make it a full meal by topping it with a poached egg. In a small bowl, toss the red onion slices with a teaspoon or two of the champagne vinegar. Set aside while you work on the rest of the steps. This helps cut down on the harsh raw onion taste. Slice the bread into ½-inch thick slices, drizzle with olive oil, sprinkle with a few pinches of salt, and grill both sides until lightly charred. Remove the bread from the grill and rub it with the sliced side of the garlic clove while the bread is still warm. Chop the bread into cubes and set aside. 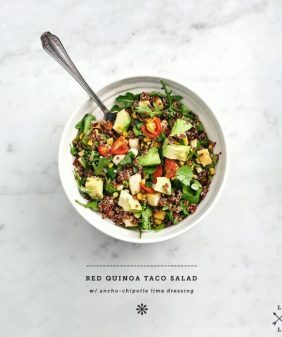 Make the dressing: in another small bowl, whisk together the olive oil, vinegar, lemon juice, and pinches of salt, pepper, and red pepper flakes. Taste and adjust seasonings. Set aside. In a large bowl, toss the bread cubes, tomatoes, onion slices, ricotta salata, and basil together with the dressing. Top with the toasted pine nuts and a few more red pepper flakes. Allow the salad to sit for 15-20 minutes for the dressing to soak into the bread. Taste and adjust seasonings. Top plated servings with poached eggs if you wish. For poaching the eggs: I love Deb's tutorial here. I love how the bread soaks up all the wonderful tomato flavours in this kind of salad. And the idea of a poached egg on top is just perfect. I don’t know–I would draw a line (fine, but there) between charred and actually burnt bread, personally. But! I definitely agree that perfectly charred bread with summer tomatoes is a perfect combination. Love it! 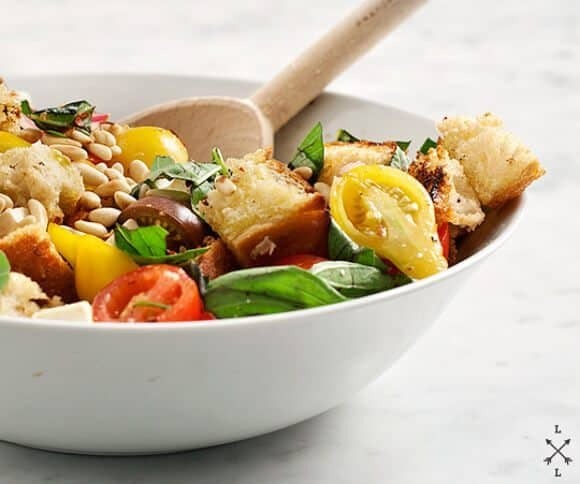 Panzanella is one of the things I look most forward to in the summer – and nothing says summer quite like grilled bread and tomatoes – this looks wonderful! LOVE the added poached egg too! panzanella has my heart. I made the best one ever when I was in SF last August. Used cowgirl creameries mozzarella and the tastiest heirlooms around. HEAVEN my favorite summer meal. Combines three of my favorite things: bread, summer ripe tomatoes, and a perfectly poached egg. Yum. Mmmm. The addition of pine nuts here is perfect. I’m so thrilled tomatoes are in season and I always forget about panzanella as a great option for using up almost-stale bread. Thanks for the reminder! 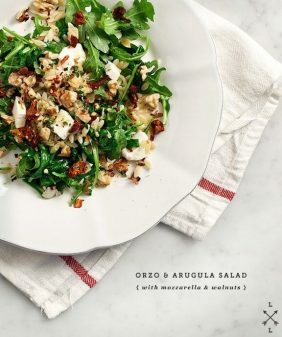 Panzanella is my most favorite means of eating in the rich bounty of summertime. There’s something about that grilled taste to a chunk of bread, rubbed with garlic and doused with fresh tomato and oil. I love adding other grilled vegetables to the salad to mix it up a bit, make it go further and color it deeper. My freezer holds plenty of day-old bread just waiting to be made in to crisp, crunchy, garlicky croutons, just for this purpose. i’d be like your dad on this subject – love the char! and super-crispy bacon? that’d be perfect in that salad too! 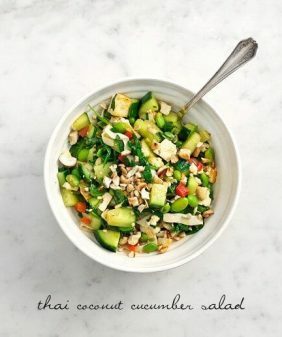 I’m not a massive fan of salads but this one has got such appeal – all the bright colours and the wonderful flavours. The charred bread would add a bit of depth to the taste I can imagine – as long as it’s not too well done like you say! 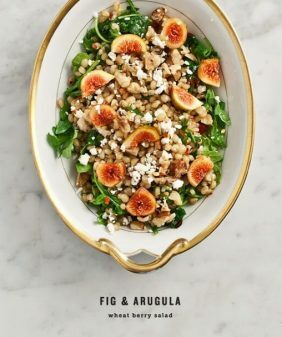 this is a gorgeous dish! I’m such a sucker for anything with a pouched egg. I have been on a total panzanella kick lately – thank goodness for tomato season! Dont you just love the little yellpw pear tomatoes, they are like heaven in your mouth, so good! yes, and those little pear tomatoes actually came from my garden! Holy moly! This was HEAVENLY.